Testing for oxidation, nitration, and sulfation of a lubricant allows trending of useful oil life and can also signal improper operating conditions, failure of engine parts (piston seals), or the wrong lubricant for the application. 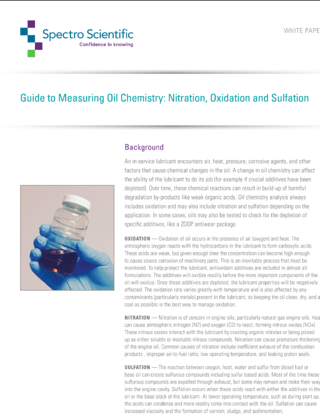 There are indirect methods of testing lubricant’s ability to perform its function, like viscosity, but the only direct method to determine whether oxidation, nitration, or sulfation is happening is to use infrared spectroscopy. FTIR instruments and methods are available for intermediate to expert users in a laboratory setting and the Spectro Scientific FluidScan allows testing for oil chemistry out in the field (or in the lab) with a portable IR spectrometer.